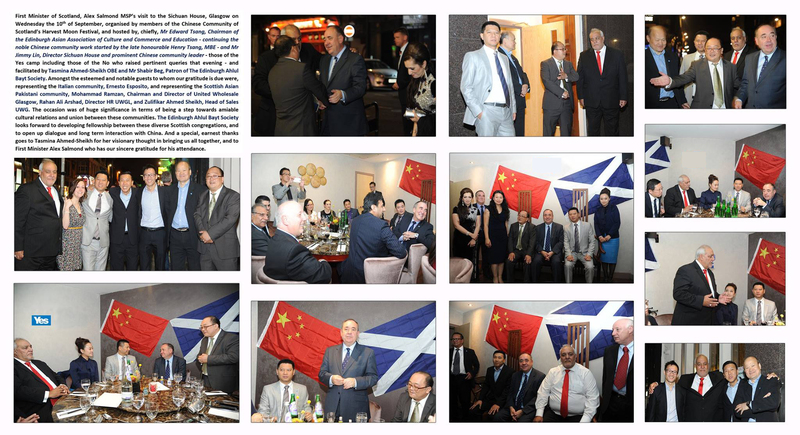 First Minister of Scotland, Alex Salmond MSP’s visit to the Sichuan House, Glasgow on Wednesday the 10th of September, organised by members of the Chinese Community of Scotland’s Harvest Moon Festival, and hosted by, chiefly, Mr Edward Tsang, Chairman of the Edinburgh Asian Association of Culture and Commerce and Education – continuing the noble Chinese community work started by the late honourable Henry Tsang, MBE – and Mr Jimmy Lin, Director Sichuan House and prominent Chinese community leader – those of the Yes camp including those of the No who raised pertinent queries that evening – and facilitated by Tasmina Ahmed-Sheikh OBE and Mr Shabir Beg, Patron of The Edinburgh Ahlul Bayt Society. Amongst the esteemed and notable guests to whom our gratitude is due were, representing the Italian community, Ernesto Esposito, and representing the Scottish Asian Pakistani community, Mohammad Ramzan, Chairman and Director of United Wholesale Glasgow, Rahan Ali Arshad, Director HR UWGL, and Zulifikar Ahmed Sheikh, Head of Sales UWG. The occasion was of huge significance in terms of being a step towards amiable cultural relations and union between these communities. 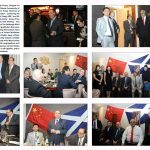 The Edinburgh Ahlul Bayt Society looks forward to developing fellowship between these diverse Scottish congregations, and to open up dialogue and long term interaction with China. And a special, earnest thanks goes to Tasmina Ahmed-Sheikh for her visionary thought in bringing us all together, and to First Minister Alex Salmond who has our sincere gratitude for his attendance.